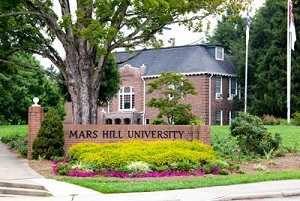 If you have a student at Mars Hill University, enjoy this perfect setting just 10 minutes away from the campus. Chestnut Mountain Cabin offers the ideal setting for a visit. Enjoy a mountain setting that is also just 30 minutes from the entertainment, arts and restaurant offerings of nearby Asheville. Or, bring your student over to the cabin for a break from a cramped dorm room. Consider inviting some friends to enjoy the benefit of the hiking paths on the property or maybe to roast marshmallows on a campfire in the fire pit. It’s a great alternative to a hotel room when you visit for a sporting event weekend or just to catch up with your child.